Bedugul is the name of both a small city and a mountain-lake resort area, which Balinese have long used for weekend retreats. Bedugul is located on the main north-south road between Denpasar and Singaraja in cool damp mountain country, an excellent base for walking trips around the lakes and surrounding hills. 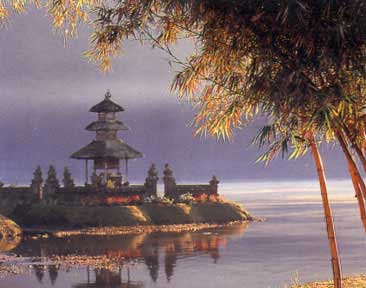 Bedugul is located in a high plateau at the center of the Island. Cool air and mists are natural for the place. A trip to the three great lakes of Bedugul, in the cool highlands of central Bali, is highly recommended as a welcome escape from the motor-mayhem of Kuta. As the road climbs in giddying leaps around the hillsides, the air becomes chiller. Eventually you reach the serene Lake Bratan. Even the swirling mists can’t hide the Lake’s primordial beauty, wrapped as if in different directions by clouds and lotuses. Nothing in Bali is meant to stand out, but the lakeside temple Pura Ulan Danu Bratan does: its thatched roofs starkly punctuating the sky in a near-perfect juxtaposition of space, water and brick. 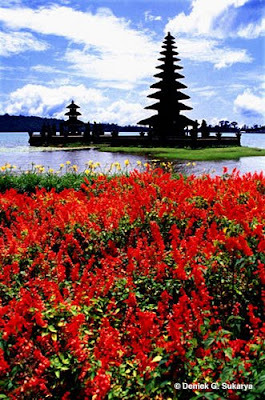 The best time to take in the spectacle is early morning, as the rising sun dyes the lake purple, then crimson, then orange, and then finally the sun breaks out, gilding the temple towers with a gleaming radiance that seems to betoken the re-creation of the world. Lakes Buyan and Tambelingan are much larger than the more developed Lake Bratan. Seen from above, they resemble a pair of spectacles, with a narrow channel connecting the two ‘lenses’. The road is a fantastic construction, running all the way along a high ridge to the north of the lakes. Right atop the saddle, with superb views over the two lakes, is the Puncak Bagus Coffee Shop, serving a mean brew made from locally grown beans. On the shore of Lake Tamblingan – reached by a fair-to-atrocious side-road – a team of villagers under the direction of village chief is hard at work restoring the ancient temple Pura Gubug. Thatch is made from the leaves of the palm-sugar tree, the strands being soaked, coaxed into submission, then cut to size. The whole reconstruction is a huge operation, but a task that the villages are doing out of sheer devotion.